I've worn this exact outfit a million times but haven't sat down to write about it until now. My thrifty nature is a huge focus of this blog, but it sometimes sits at odds with my other huge love - vintage. Now, my day job has shown me that you can find incredible vintage pieces on a tiny budget, but the problem with vintage is that if you let a piece go, you're probably never going to see it again. Which is why around November time on a Saturday mooch around town, I was persuaded to ditch my usual money-cautious ways and buy this corduroy dress. Being brutually honest, I've never given much time to Pop Boutique as I always thought the mark-up were a little on the high side, but I was pleasantly surprised by the Leeds store - lots of on-trend repro stock and a whole floor dedicated to genuine vintage. As soon as I saw this little number, I was sold. 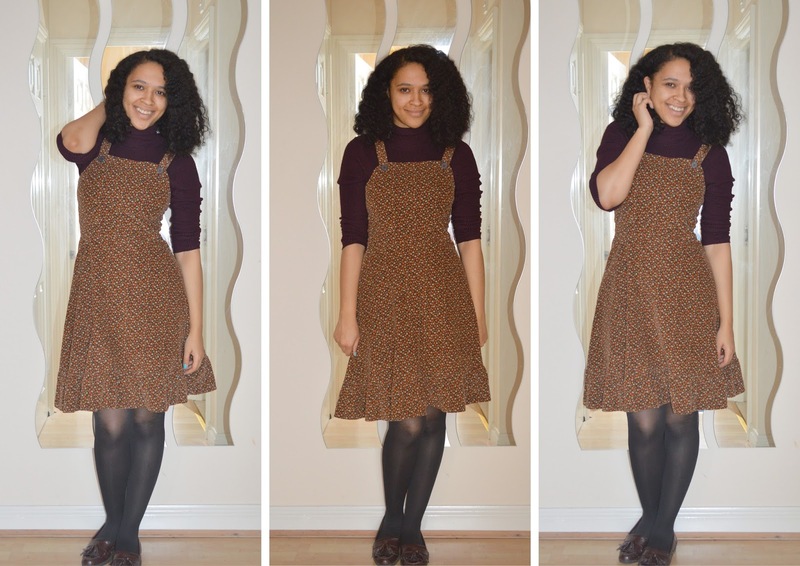 It ticks all my sartorial buzzwords - corduroy, pinafore, floral, autumnal. It looked a little tiny on the back and was clearly marked as a small, but I didn't let that deter me - a few wriggles in the changing rooms and it was on, fitting perfectly. Probably the quickest £28 I've ever dropped on a dress, but the cost-per-wear is probably already in the pennies. The moral of the story? When you see something you love that's probably older than you are, you should probably buy it. Especially when it's exactly your size. And especially when it comes from a shop you might have previously overlooked. What they say really is true - sometimes you just gotta treat yo'self. Love this dress soo much! I love pinafores at the mo. I will check out the vintage shop! Thanks for a great post and for following my blog on bloglovin! !